At times, one may get an impression that Marvel and DC Comics have control over the whole comic book industry. Although it is far from being true, the comic book media is on the rise now with the most popular adaptations coming from the Big Two. Still, the world of comics is not limited only to the Big Two and there is a great number of other publishers with brilliant adaptations, which we will cover in this article. This series, created by Brian K. Vaughn and Fiona Staples, has been much raved about. It tells a story about two refugees who face a bizarre, modernized fantasy world. Saga is a must-read for everyone, so if you have not done it yet, now is the perfect time to do it. Enthralling and intriguing, SAGA is well worth every minute you spend reading it. The Image Comics’ book Curse Words is Soule-written magical drama, which tells the story of a modern-day evil wizard and challenges he has to tackle. If you are a keen admirer of Harry Potter or Rick and Morty, you surely should not miss out on this gripping comics book. The ironic portrayal of the arcane arts is absolutely unique. However, mind that wielding magic portrayed in the book is not always that magical. If you are not overly keen on Buffy the Vampire Slayer, you should know that the comic book version of it has undergone some major alterations. Studio’s Buffy decided to create a complete remake of the story. A brand-new Buffy universe will surely keep even the most long-standing fans on the edge of their seats. However, if you do not belong to this category, just try to enjoy the folks behind the comic who are truly worth observing. Although the TV show Riverdale has become a household name, you will be astounded by the fact that Archie Comics, on which the TV series is based, is in fact over 75 years old. The nowadays setting of Riverdale does not mirror the place in Archie 1941 where Archie Andrews is a young man enlisted into military service. If you admire Archie Comics, World War II history or just want to see familiar characters in the new light, put this book on your reading list. The Bureau for Paranormal Research and Defense has not appeared on TV for 11 years. However, with a brand-new movie Hellboy releasing this year, it finally stages a comeback in the cinema. Interestingly enough, B.P.R.D. stories did not stall completely in the gap between films. Dark Horse has been incessantly bringing out splendid stories set in Mike Mignola-creates universe, which has not become any worse. With the movie’s debut in April, now it is high time to get back into the world of the B.P.R.D. At any rate, you should not let this engrossing fantastic detective series pass over your attention. If you are absolutely indifferent to the mentioned above magic trend, we have some pretty bad news to deliver. You still need to take a look at Bitter Root. In fact, Bitter Root is not nearly as brand-new as Saga or Curse Words. It takes place in the 1920s Harlem, where voodoo and the Jazz Age are combined to create a story, which strikes the right balance between noir and Occult drama. This book will certainly hit the spot if you are a fan of historical fiction, particularly of that which revolves around New York City. Additionally, if you are drawn to gruesome adventures in flapper costumes, Bitter Root is definitely up your street. Although this list was intended to be without the Big Two, it does not mean we have not included some unknown superheroes in this list. Basically, a lot of characters in Black Hammer were created under the influence of either Marvel or DC Characters. Still, the world, in which the story takes place, has nothing to do with both. Black Hammer’s surreal, David Lynch-esque universe is strongly reminiscent of superhero comics and scrambles them, transforming them into an unreal, existential mystery series. Although DC and Marvel are wholly in charge of an umpteen number of superhero stories, Black Hammer testifies to the fact that they clearly do not own all of them. The following book is based on mythology, which means you will surely take to it. The Wicked + the Divine is a well-earned odd-on favorite in our top 10 comic books even without the mythological plot. Due to the tight storytelling, unique artwork, and the perfect cohesive combination of two classical myths, this book is a genuine masterpiece of its own. If Black Hammer proved that Marvel & DC are not dominant in the superhero market, The Wicked + the Divine is a testament that they have not yet taken the control of mythology either. We do not imply that there is something wrong with the Wonder Woman or Thor story. At the same time, there are some close similarities with WicDiv. It just that it resonates with some cultural memory that is deeply rooted in humans, a memory of the times when gods and monsters were not just fiction and the magic was anything but make-believe. This story is an example of a simple but truly masterful comic book. With the touching storyline and sensitive art, Monstress is a rarity in the comic book market since it brings the medium up as a whole. Marjorie Liu obtained two Eisners just because of that, and if you have not had the opportunity to come to know why, now it is the perfect time to do it. 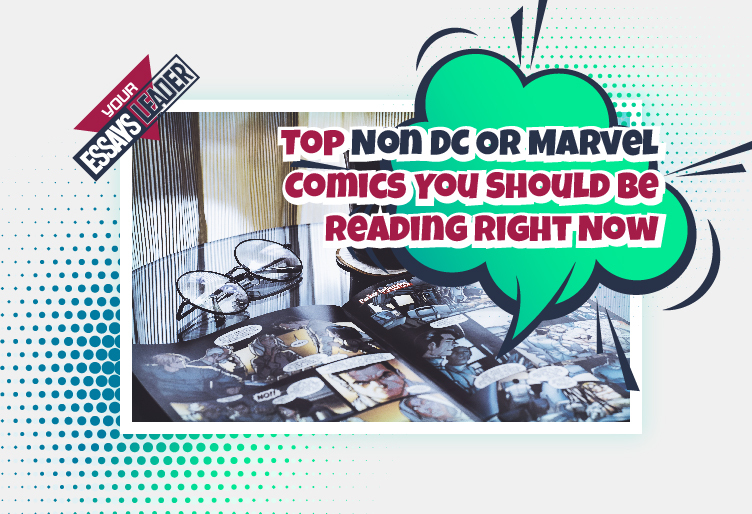 Choose any of the above stated books to experience what the present-day comics world has to offer but do not miss out on Monstress to find out how the comic book history is being made.